1) Always make sure that the surface you are applying the bow to is clean and dry. This will allow the bow to properly adhere to the surface material, and increase the likelihood that the bow will remain exactly where you want it until the gift recipient can eagerly tear through the wrapping paper. 2) When applying the bow, peel back just a little bit of the protective paper that covers the adhesive strip, rather than peeling it all away first. Once you have the little bit of adhesive strip exposed. position the bow the way you want it, and then peel the protective paper the rest of the way off. This will allow you to place the bow at the exact position you want it. 3) Don't always use the exact shade or color of the wrapping paper for your bow. Go with an accent color, or one that complements the primary wrapping paper color. 4) Try using multiple bows, and combine different types of bows for a unique look. 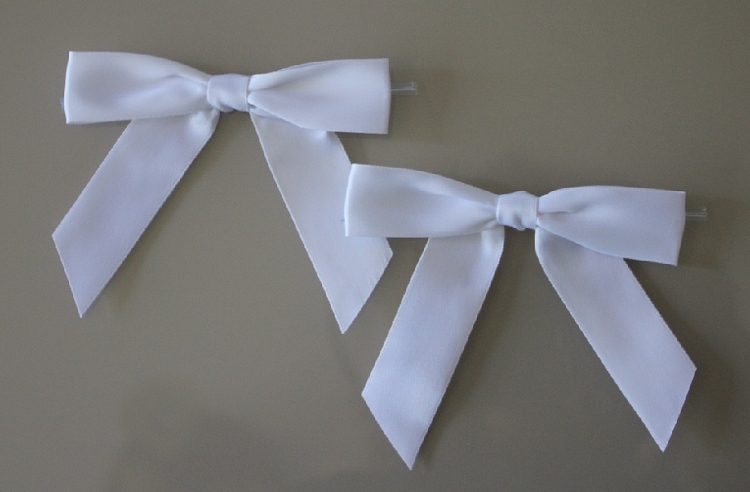 For example, using a gift bow with a few segments of curling ribbon can create a very elegant look for the gift. 5) Use different placements for your bows. Everyone puts the bow on the corner of a square or rectangular gift. If you want your gift to be unique, try not being like everyone else when you apply the bow. 6) Always keep an extra supply of bows handy, especially during primary gifting holidays. There is nothing worse than running out of bows when you're wrapping presents, and since bows are so inexpensive, it just makes sense to have a little back stock of them around.